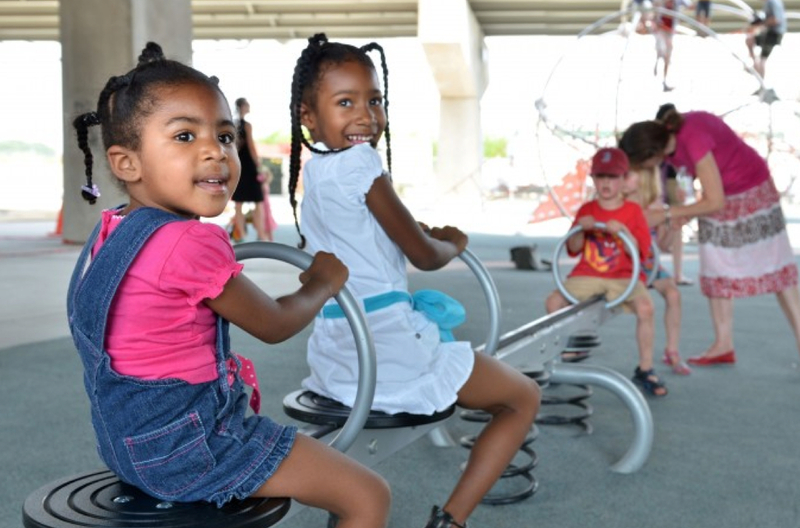 Ontario’s towns and cities could be on the verge of a grassroots playground revolution. It’s already taking place in 13 communities across Canada’s second largest province. GIVER, a new TVO public television reality program for children, shows how kids themselves can make a difference and inspire broader community action. It’s the kind of experiential television that has the potential of creating ripples. 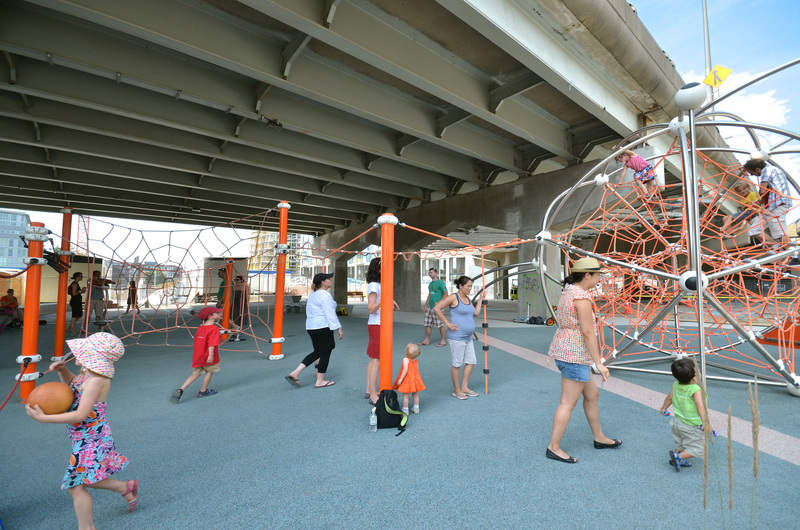 Seeing young designers and builders mashing up playgrounds in a truly kidcentric vibe is sure to have other kids, parents, municipal councillors and parks and recreation directors sitting up and taking notice. J.J. Johnson is one of the principals and co-founders of Sinking Ship Entertainment, co-producers of GIVER with TVO. He’s almost evangelical when speaking about the the impact these small scale community projects are having on the kids who participate in the planning and the builds. The kids learn about taking control of their environment, making something that suits themselves and their friends. It also shows them that it’s possible. The kids are out there getting people to donate stuff. They’re learning that it’s not as complicated as they might have thought. Series host and kid crew leader Michael lays out the recipe at the top of each episode – six kids, three days, one mission – build a playground with their community. It’s all about kids with ideas and tools pumped to learn. They’re having fun, becoming community minded and learning practical life skills by refurbishing, rebuilding and renewing their public playscapes. GIVER, targeted at the six to nine-year-old demographic, is part sweat, part play and part problem solving with a dash of magic thrown in for good measure as the clip below shows. Even for the creators of successful series like This is Daniel Cook and Dino Dan there were some unanticipated learning curve moments as GIVER was coming out of the starting gates. 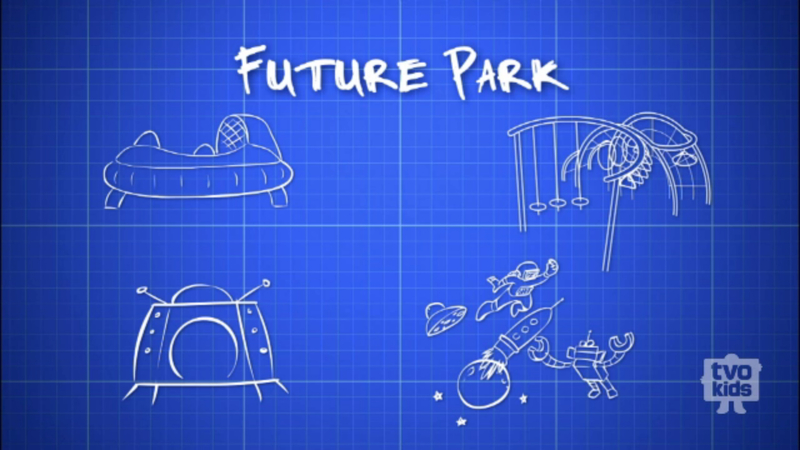 When Johnson received a $460,000 quote on the show’s first playground design, he thought it was all over before they even had a chance to begin. 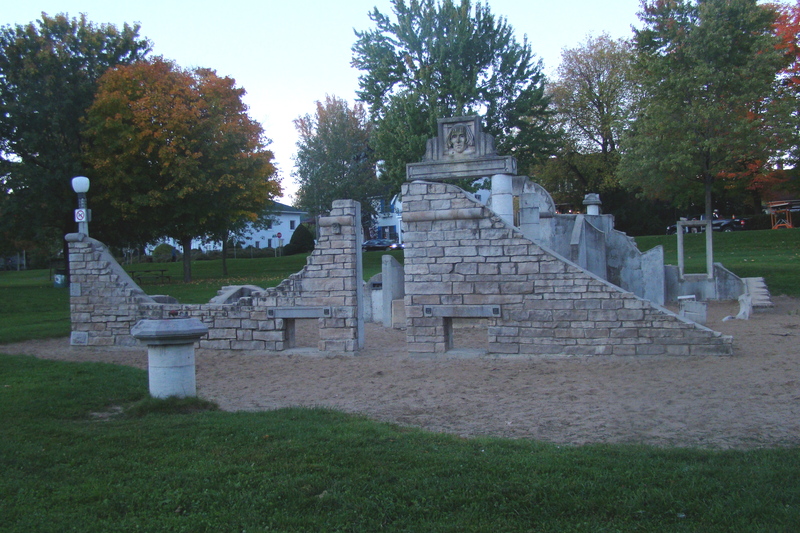 With a budget of $10,000 per playground, Johnson knew that they would not be able to rely on standard design or build approaches. Not surprisingly, the path to success was grounded in community engagement. The GIVER team called on local businesses to donate supplies and on volunteers to help with construction. Experts were available to advise on safety issues and the kids themselves generated some do-it-yourself design. Donations of time, labour and materials in conjunction with more modest designs helped the show stay within budget. The GIVER teams, local kids were recruited from each community, were able to create memorable experiences, playable public spaces and stay within budget. Johnson thinks the playground posse from Hawkesville (population – 300) might just have put together the best finished product in the show’s first season. 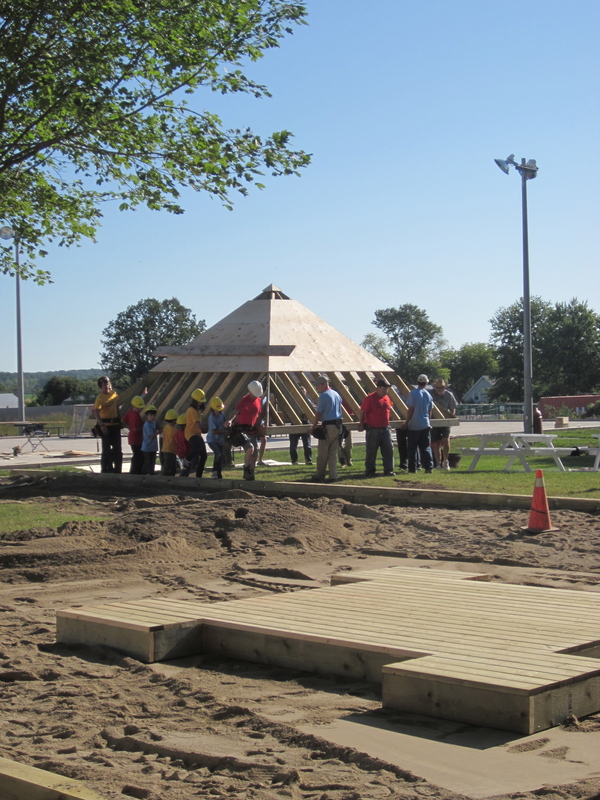 Kids there now have a giant sandbox that Johnson is hoping is the biggest in Canada, an 8′ tall pyramid climber and a sandcastle with a hidden passageway. Local craftspeople were instrumental in making the design come to life. This flickr slideshow captures the impressive transformations the kids reigned over in four of the participating communities – Hawkesville, Hamilton, Etobicoke and Batawa. In the course of the first season there has been a lot of learning. Johnson wants to do his best to share the GIVER experience as widely as possible. Blueprints of the designs will be posted online for other communities to use and adapt. Currently there is a tip sheet available on what is becoming an extensive website. We’ve met so many communities that have been fundraising for years trying to build a playground because they think it’s $400,000. If we can share some hints on how we can build with proper approval processes and some of the scarier things you think you can’t do, I think we’ll find that they can build these things for $10,000 to $15,000 just by activating people in their community. Another important plus in this process of community engagement is pride, ownership and a strong link to all those individuals – kids and adults – who helped create something new. Without exception, usage of the GIVER playspaces skyrocketed when compared with pre-show levels. So what do the kids think of all this? If you live in Ontario, you can find out by tuning in at 6:30 p.m. EST Tuesdays. Check the TVO schedule for additional air times. If you live in Canada, you can view previously broadcast episodes online here or by clicking through on the image below. Click through on image to TVO’s GIVER page. If you’re from somewhere else in the world and can’t generate a Canadian IP address then you’ll either have to be satisfied with Johnson’s take on it, or start up your own GIVER type show. If you do the latter, please flip us a note. The last word goes to Pat Ellingson, creative head of TVOKids. It’s all about kids doing something to help others and connecting to their communities. GIVER shows just how amazing, intelligent and caring young people can be. It’s wonderful to introduce a child to something new. Every episode you see the light bulbs coming on. It was like watching education in action, a spark was being created. Kids were engaged. It was the best classroom. Thanks TVO, Sinking Ship Entertainment and all the kids giving something back to their communities. Let’s hope you’ll be back for subsequent seasons. 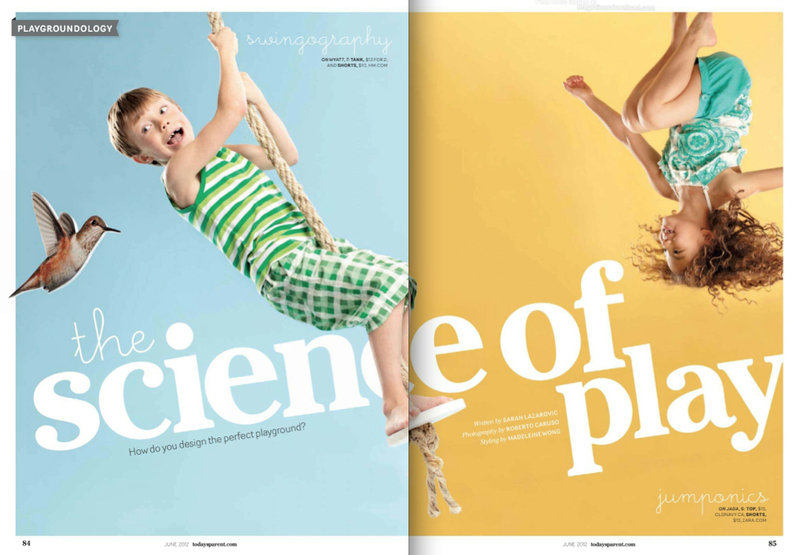 Today’s Parent, a Canadian magazine, ran a feature in their June issue on playground trends and designs – The Science of Play. Sarah Lazarovic’s article provides an excellent overview of some of the current thoughts and perspectives on the world of playgrounds. She draws on a number of knowledgeable people in Europe and North America to illustrate the story. As founder of the blog PlayGroundology, and a novitiate playgroundologist, I was very pleased to be asked to contribute a few comments. When Sarah and I spoke, I prattled on and on and on. Her questions provided some airtime to share thoughts on a topic I’ve become passionate about. I now have a modest couple of years under my belt researching and conducting interviews that eventually wind up as posts in this blog. My kids and I have also racked up some practical experience putting close to 100 playgrounds in five provinces through their paces. Just today, my son Noah-David piped up to me en route to one of our current local favourites, “Papa, we’re playground explorers, aren’t we?” Our hometown adventures, captured since the summer of 2009 in Halifax Plays, are just about to get underway for this year. The Science of Play hits all the high notes on its whirlwind tour. Sarah does a tremendous job of connecting the dots on a story where the subject matter defies stereotyping or pigeonholing. There is no one size fits all when it comes to public playspaces. Sarah’s interview for the Today’s Parent story was a chance to share some of the playground knowledge I’ve acquired in the recent past. More importantly, the story presents a significant opportunity to build on Canadian conversations about what goes on behind the scenes of playground planning and development – discussions around policy considerations, design and financing models for example. It’s in that spirit that I offer this postscript to Sarah’s article in order to expand on a couple of the points and provide some context around one of my comments. Comparatively speaking, from what I have seen in eastern Canada, there is a lack of creativity when it comes to playground design in this country. All we have to do is look overseas to Denmark, Germany, the UK, Sweden and Finland where design is flourishing. Their towns and cities have not been overtaken by the march of composite plastics and prefab metal posts and beams. Although creative design is not a hallmark of the Canadian playground ethos, it is not totally absent from the landscape. There are bright spots well worth a look. Nestled on the Mountain in downtown Montreal is Salamander Playground – green grass, grand trees and a water orb. In the nation’s capital, Strathcona’s Folly is a time capsule playspace made from architectural bric à brac, a treasure of form and texture. 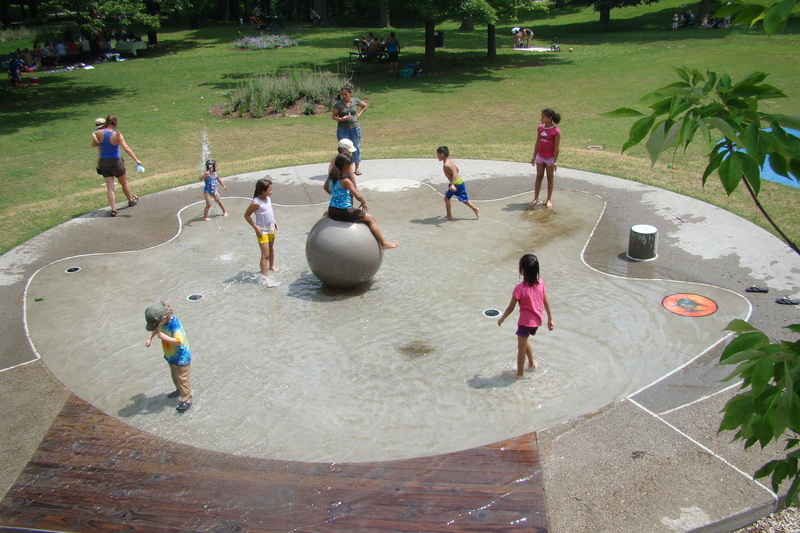 Water Orb – Montreal’s Salamander Playground. Click here for Original Designs slideshow. The Magdalen Islands’ Boats are anchored safely ashore as they crash and crest through imaginary seas. 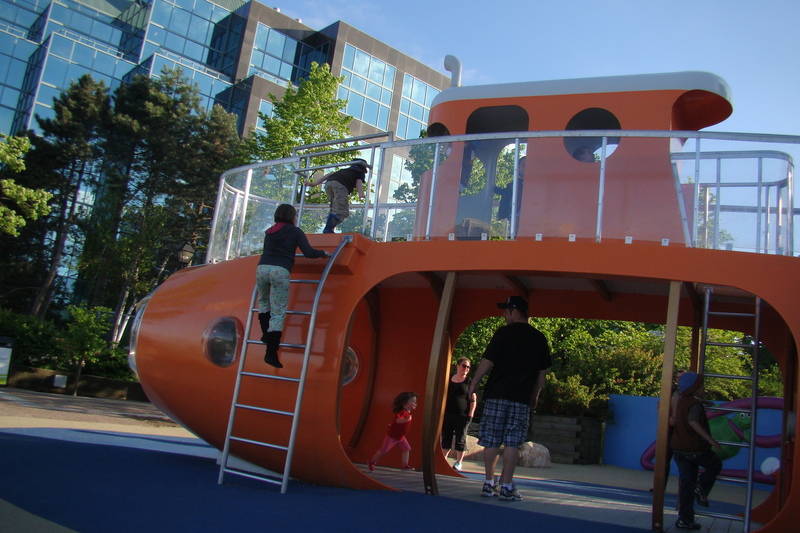 And as home port to Canada’s East Coast Navy, maritime traditions run deep in Halifax and now kids can pretend they’re on a diving adventure à la Jules Verne on their own orange submarine. In Winnipeg, there’s Assiniboine Park Playground opened in the spring of 2011 that puts nature front and center. 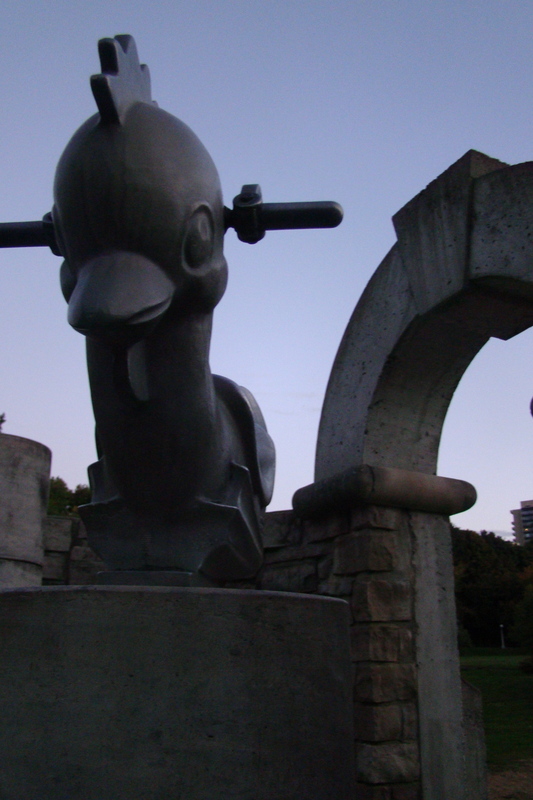 I’m hoping someday to get out to Richmond, B.C., just to test and tour that funked up Garden City Park Playground. 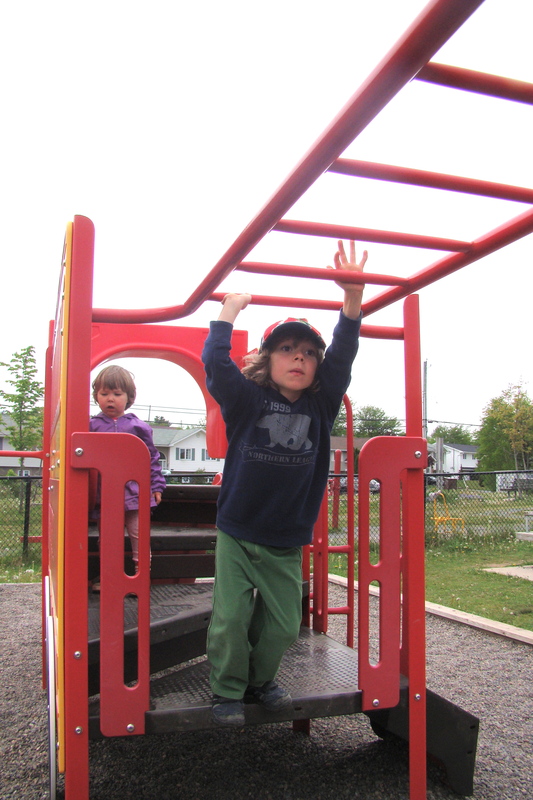 In Halifax, we are well served by the number of playgrounds – over 300 – and by high maintenance standards. But with the exception of our orange submarine, we’re kind of sparse on the discovering new design frontiers department. As parents, if we’re not satisfied with the current state of playground design then we have a responsibility to band together and engage our municipal governments and/or school boards to bring about change. This is not change just for the sake of it. It’s about creating enticing spaces with public funds that will help to break the pall of physical inactivity which is becoming endemic. It’s about valuing creativity in our children and local designers and fashioning space that calls out for imaginative play. Canada could benefit from a voluntary sector organization that focuses exclusively on advocating for play on behalf of kids. These organizations exist in Europe and Australasia. I’m thinking here of Play England and its independent sister organizations such as Play Wales which hosted the 2011 International Play Association World Conference. These groups conduct research, develop policy guidelines, compile and curate online resources, work with and challenge government, deliver programming and fulfill an important role in the public promotion of play. They are a non-commercial voice of sanity. In the US the social entrepreneur group KaBOOM! does similar work promoting play through Playful Cities USA in addition to spearheading playground builds with local communities. On the question of costs, customized designs local or otherwise, can be more expensive but this is certainly not always the case. If there are no requests for alternative playground designs being made of a municipality then the path of least resistance is a trip to the numerous manufacturers who provide tried and true professional service that does not deviate from code and embodies more of the same old, same old. With price tags running anywhere from $100,000 to $500,000 they’re certainly not in the ‘cheap’ category. Playgrounds are big business. 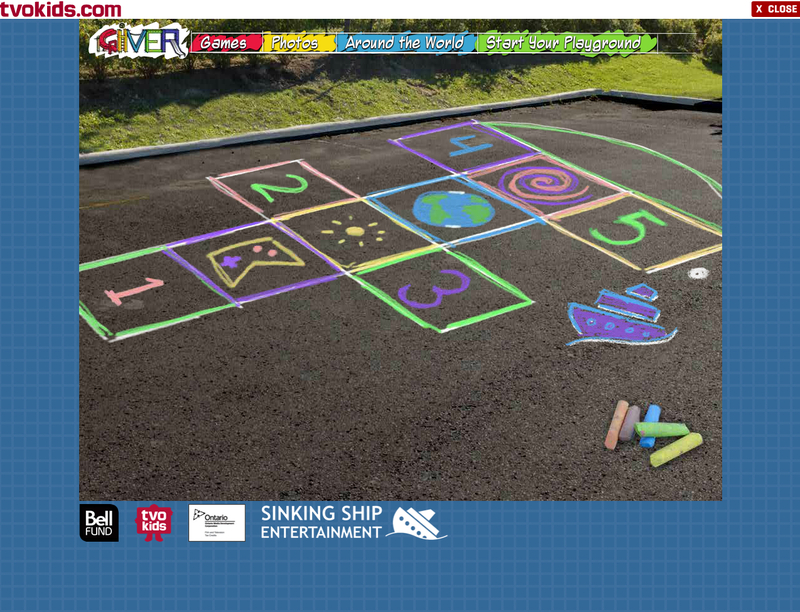 Ontario’s public broadcaster TVO with Sinking Ship Productions has co-produced the first season of a show that’s all about do-it-yourself improvements and renos to local playgrounds by the kids who use them. Each project comes in at $10,000 cash with additional donations and volunteer labour. It’s an interesting model that might catch on. Read about it soon here in PlayGroundology. Thanks to the editors at Today’s Parent for assigning this article. This is a conversation that should continue to grow. There is more to this universe of play and playgrounds than meets the eye. I don’t have any sophisticated media monitoring tools at my disposal but I sense there is an uptick in Canada’s mainstream media on coverage that focuses on play and playgrounds. I’ve seen stories on TVO, heard them on CBC Radio and read them in The Globe and Mail, The National Post, The Toronto Star, The Calgary Herald and The Vancouver Sun to name some that come immediately to mind. The setting is magical and enchanted, a page right out of children’s literature. Saint Exupéry’s The Little Prince would find a welcome refuge in this playscape, another station on his voyage of discovery. I can see the golden haired boy exploring in the midst of the ruins. There he is meditating on the slipperiness of time while his sheep grazes on the surrounding grass. This imaginative structure would also be right at home in the child-build-it world of Saint Denys Garneau’s poem, Le Jeu. This is a place to make believe, to create, to discover. 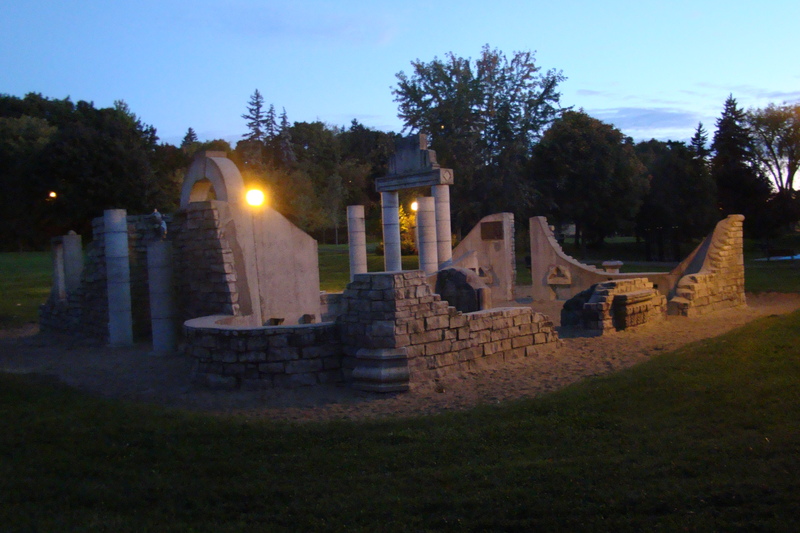 In the here and now, a remarkable playscape gradually emerges from the shadows in Sandy Hill’s Strathcona Park. The first fingers of morning are skittering across the Rideau River shallows in Ottawa’s east end. The waking light lends a softness to forms and a timelessness to place. This could be antiquity. Pillars, arches, great blocks of stone, walls in faux disrepair and sand strewn in glorious abandon create a delightful home for play. At day break, the ruins are quiet. The playgrounder kids are still at home. In solitude, I can unhurriedly explore this space I’ve touched and breathed before. Strathcona’s Folly, as it’s called, is a place I came to with my daughter Alexa on a few occasions nearly 15 years ago. Even with the intervening years, I still recall a sense of marvelous wonderment from those visits – a sense that is instantly refired on this particular fall morning. 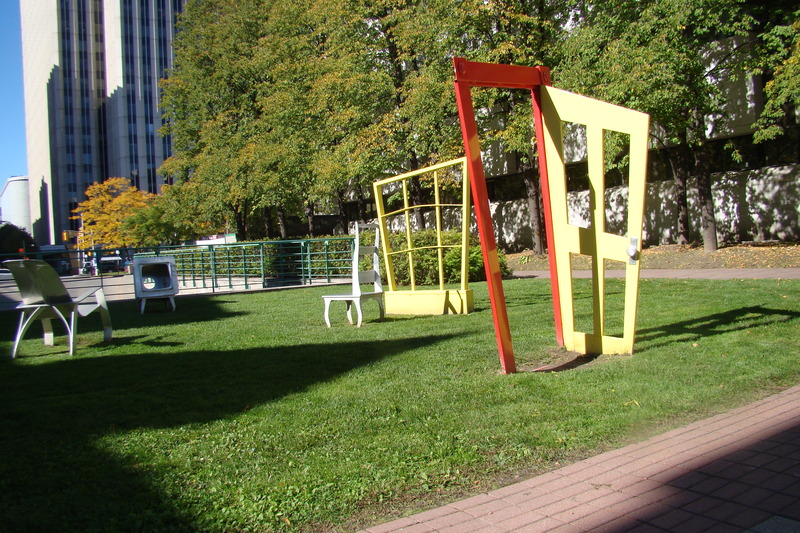 Canadian artist Stephen Brathwaite designed this playable art as a commission for the City of Ottawa. It is a distinctive playscape, as unusual as it is unorthodox. Only two elements are of the standard playground ilk. A bronze dipped body of a springrider rooster perches atop a column where only the most adventurous would attempt to saddle up. At ground level sand fills the space. These grains of time are constantly rearranged by wind, little hands and feet, permeating everything, drifting into the cracks, crannies and crevices. Range Road borders Strathcona Park’s western boundary. Large stately homes, some of them now embassies, look across the green sward to the rippling Rideau River and to Vanier beyond. 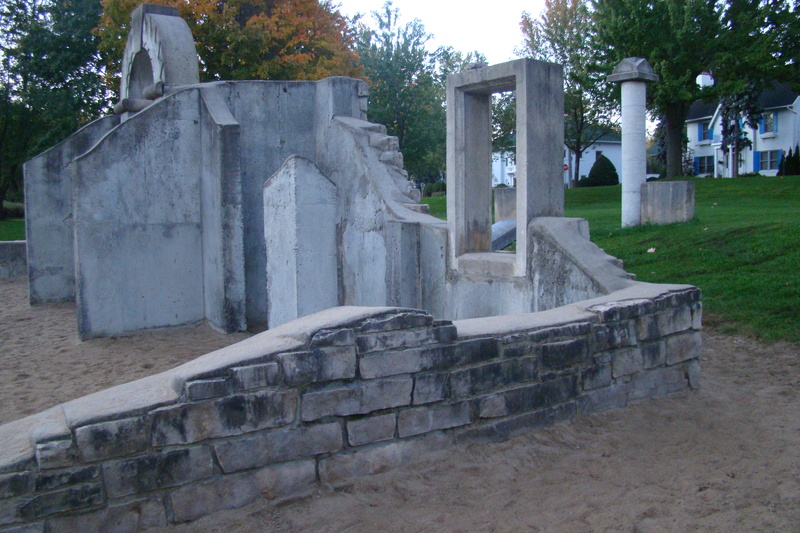 Brathwaite’s idea was to make a piece that would appear to be the ruins of a neighbourhood home. 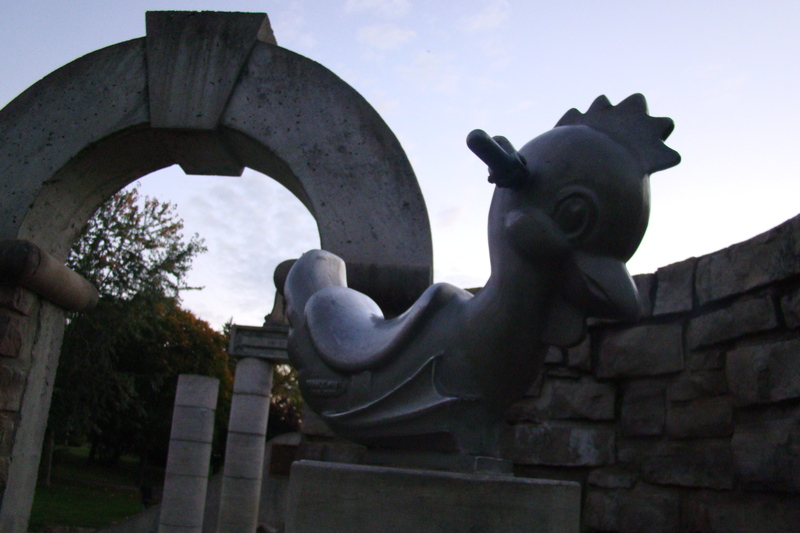 The artist was inspired by his own memories of childhood play with his brother. They loved putting together structures with their Canadian Logs building set, laying out roads in the sandbox and cruising their Dinky toys around the towns and landscapes they created. 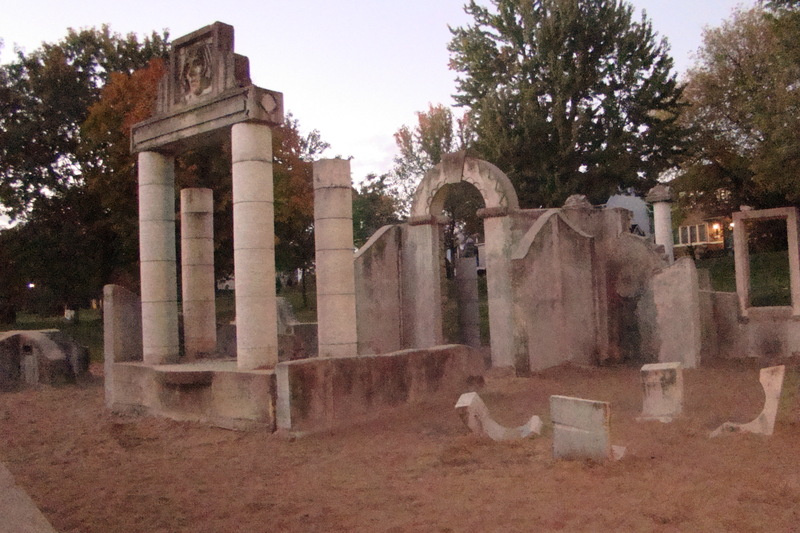 Strathcona’s Folly is a grander scale of their imaginings as kids. Brathwaite reclaimed and recycled building ‘blocks’ from a variety of sources. 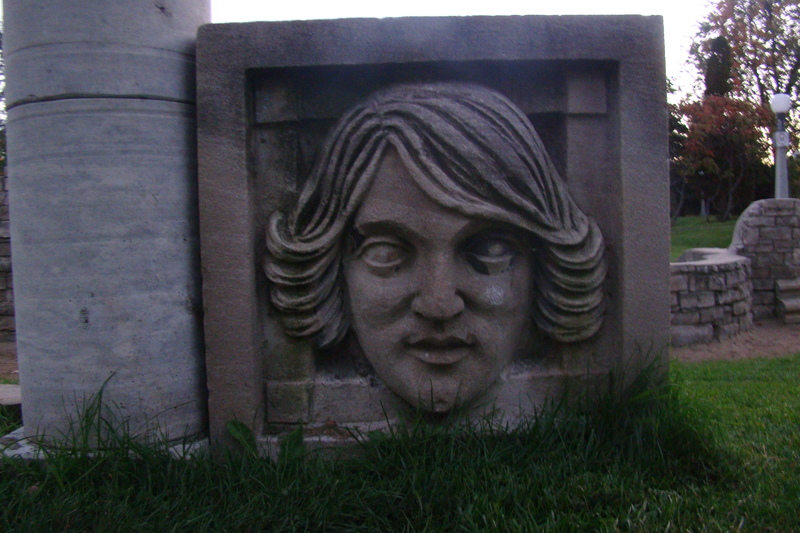 The blocks adorned with youthful art deco faces were originally features of a branch of the Bank of Montreal. 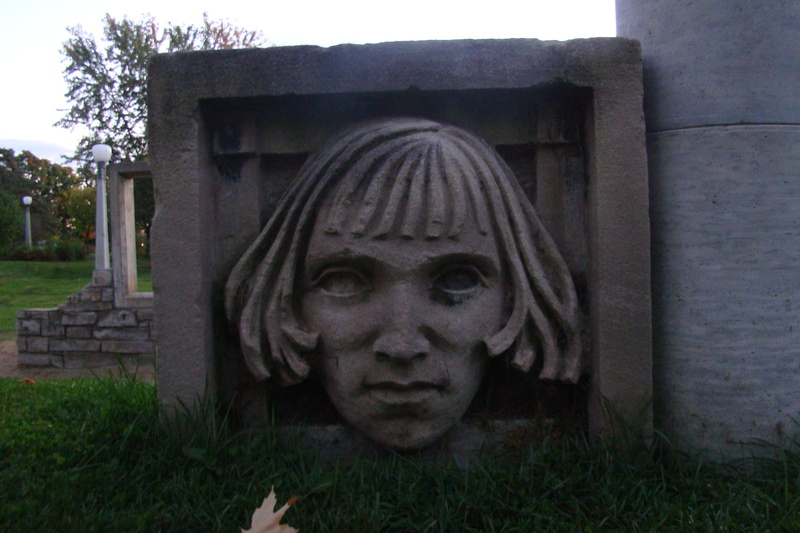 Now three chiseled portraits peer out from the playscape at everyone arriving from the western and eastern approaches. Other architectural hand me downs include off cuts from the pillars that were used in the restoration of the Rideau Canal, balustrades from the Chateau Laurier hotel, as well as miscellaneous discarded treasures from Canada’s Parliament Buildings, the Royal Canadian Mint, a local convent and the Capitol Theatre. This is a project completed with passion, care and attention to detail. Surveying the finished product, it all looks so easy and effortless. However, some unanticipated problems were encountered during the initial construction phase. A high water table resulted in trench walls falling in during excavation. This required an alternative approach to the conventional footings and foundation. Forming tubes, surface beams and injected cement resolved the difficulties. When concrete was injected into the forming tubes it displaced water that shot out like a geyser mixed with cement and rained down on the workers – not the most desirable effect in chilly autumn weather. This may have been one of the contributing factors that had City of Ottawa workers calling the new playscape Brathwaite’s Folly. Neighbourhood children had their curiosity honed to a fine point during the following summer’s build. Doug Bamford who collaborated with Brathwaite on the installation and construction remembers a young Russian boy from the embassy across the street. He was a daily visitor to the site, watching the pieces take shape. The pillars, blocks and arches are massive from a child’s perspective but there are surprises for tiny hands to touch and discover recessed in the inside walls. Miniature animals posed in groups of two or three stare out from their frames. The bronze menagerie was cast from real toys and is placed at the eye level of a small child. After all these years exposed to the elements and the inquisitive hands of little boys and girls, there is still some lustre left in the figurines though speckles of green are starting to show. 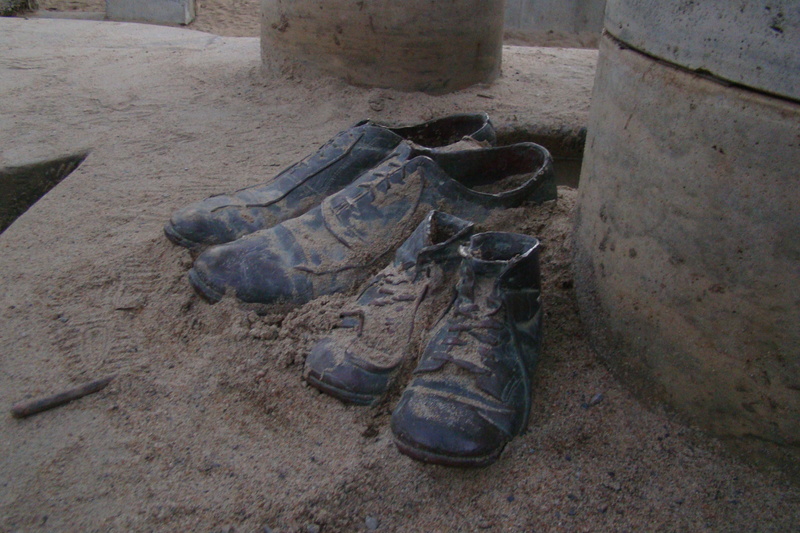 Two pairs of shoes tucked away in a corner at ground level have also received the bronzed artefact treatment. They are the artist’s own shoes stepping through time from the boy builder to the man artist. Over the years, Strathcona’s Folly has been recognized by local media in ‘people’s choice’ campaigns as the best playground in the city. The local Shakespeare in the Park theatre group sometimes uses it as part of its set. 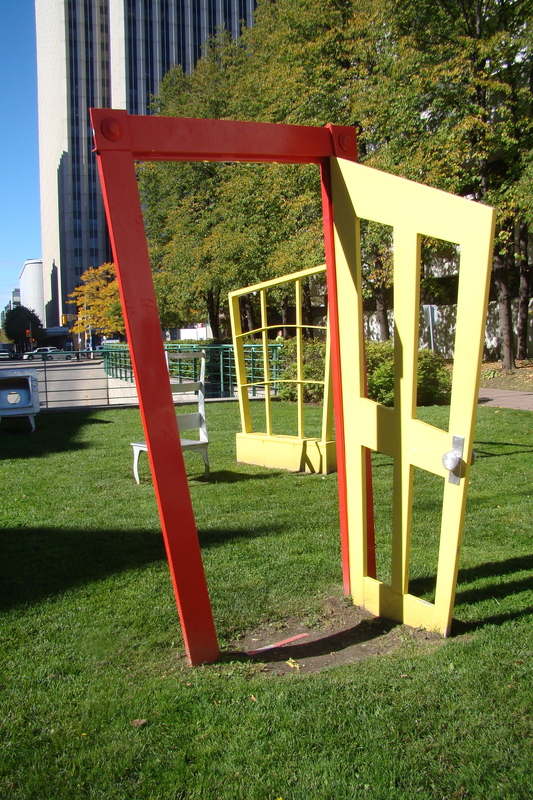 It is a mainstay of the public art landscape – a play place that encourages creativity, curiosity and wonder. Brathwaite and Bamford continue to work with one another on public art projects and commissions. With any luck, perhaps we’ll see them turn their hands and imaginations again to the world of child’s play. 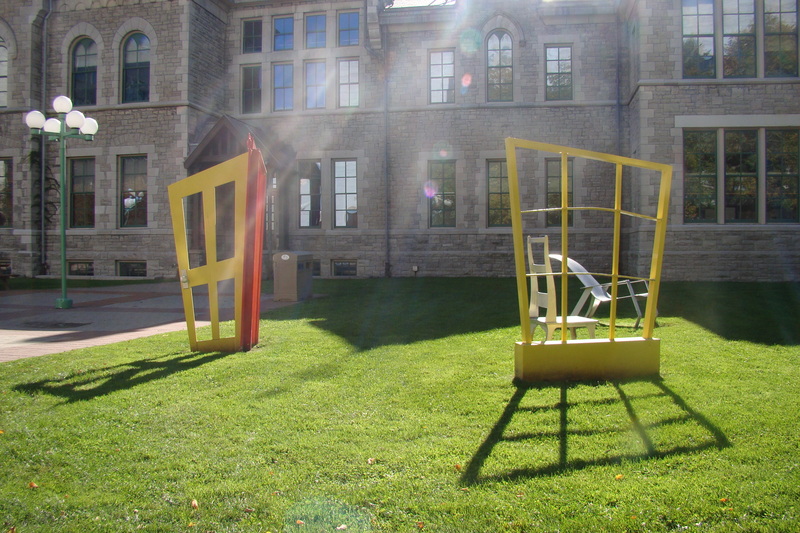 In the interior courtyard of Ottawa’s City Hall there is a place where the door is always open. The Living Room is a multiple piece static sculpture by the design duo at Urban Keios . This is art as playground, an open invitation for children to make believe and scamper about slightly oversize chairs with out of kilter door and window frames defining the space. It looks like a set prepped for the shooting of a claymation adventure where we’re just waiting for the action to begin. There in the near distance is a TV permanently piping in the imagination station. Although The Living Room is not designed as a playground per se, what kids could resist stopping off momentarily for a touch of make believe, of playing house, of filling the blue sky space with movement and laughter? Somebody’s having fun. The grass is worn away down to hard packed earth between the door frame and around the chairs. I should have taken the opportunity to rest my own weary feet for a moment that day. 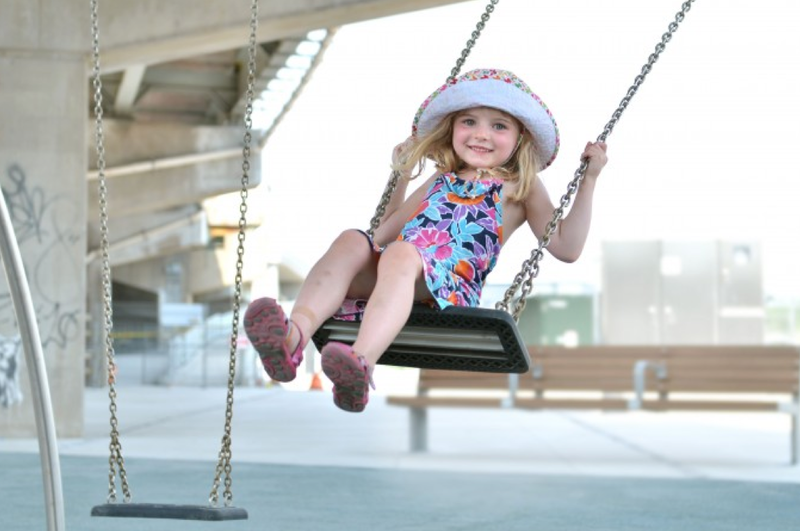 PlayGroundology has more to offer from Canada’s capital in a subsequent post. Stay tuned for Strathcona’s Folly, a timeless playscape constructed with architectural throwaways and lovingly designed with surprises for small hands and eyes. All materials, unless otherwise attributed or credited, copyright ⓒ 2010 Alex Smith. If you’re a non-profit or not-for-profit group, feel free to hyperlink, excerpt, or reproduce the contents of this post. Please reference PlayGroundology. For commercial reproduction of this content, please consult the editor. It’s just coming up to four weeks on the road for us through the Maritimes, Québec and Ontario. As it turns out, blogging and web surfing aren’t all that compatible with this edition of family road tripping. We’re frequently unplugged from the net and there’s no opportunity to set aside blocks of time to write and prepare material for posting. Go figure, I don’t know what I was thinking… With three energetic kids under five years of age we’re kept hopping even more than at home. We’re having plenty of fun with family and friends and discovering a few new playgrounds along the way too. Regular posts at PlayGroundology will resume the week of July 18. Upcoming stories include the Mont-Royal playground in Montréal, PlayGrounds in the News, the Sorel Playground Marathon and Global Playground Bloggers II. Click here for a slideshow of some of the playscapes we’ve visited in the last few weeks. It’s interesting to see how public play spaces display their own distinctiveness from place to place.